You might not realize it, but after carrying load after heavy load day in and day out, you can start doing some serious damage to your truck’s bed. Over time, scratches and dents turn into bigger and bigger issues, and overexposure to the harsh elements can lead to rust, cracking, or peeling. In order to get the most out of your truck, it is important to protect all of it, even the tough exterior. That is why it is important to invest in a spray on bed liner. This liquid coating will harden into a protective layer that will prevent all sorts of damage and restore years of usefulness to your trucks life. Trust me, this investment in the health of your ride will also payout big in your bank account. Follow this useful guide to determine which spray on bed liner is the best match for your truck. What Is The Best Spray-On Truck Liner Brand? When deciding on the best spray on bed liner for your truck, it is important to look at a variety of qualities. You want something that will spread evenly and easily, protect your truck bed from all the wear and tear of heavy duty use, and will also look great. These are some features you should be looking for when deciding which spray on bed liner is best for your particular needs. If you cannot get the spray on bed liner to come out of the can, then it really is of no use to you. That is why it is important to make sure that the spray on bed liner that you decide on is one you can actually use. While they all spray in some way, there are a couple different ways they can be applied. One of the quickest and most effective ways to apply a spray on bed liner is with a spray gun. These guns spray the liner wider and more evenly to achieve a more uniform, attractive covering. Other bottles have aerosol or spray bottle applicators that clog up and easily, leading to uneven spray and wasted product. When applying a spray on bed liner, the number one thing you want out of the liner is for it to be effective. If it is not doing its job – protecting your truck bed – then it is a waste of time and money. Of course, you need to make sure that your bed liner is able to stand up to scratches, bumps, dents, bangs, and scrapes. On top of that, they need to be able to resist the different elements they will be exposed to: rain, snow, hail, humidity, sleet, dirt, and more. If it cannot handle the outdoors, then it will not be able to provide you with the protection your truck bed needs. Beyond protecting, the spray on bed liner also needs to be able to adhere and stay stuck to the bed. If it does not bind to the truck bed then it will not protect your truck from anything at all. While for most people the most important thing in a spray on bed liner is protecting their truck bed from wear and tear, it is also key to make sure that your bed looks good. First, you have to make sure that the color of the spray on bed liner fits with the rest of your truck. In addition to color, you should also check out the texture and pattern. Some liners dry more rough and course, while others are smooth or plastic feeling. 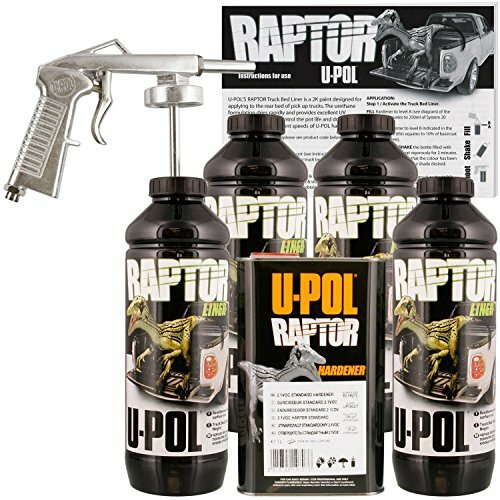 The U-POL Raptor Spray-On Truck Bed Liner kit is arguably the best spray on bed liner that money can buy. This liner is as tough as they come. It can stand up against the fiercest elements. Neither rain, sleet, nor snow will effect this liner’s protective ability, meaning that your truck bed is always protected from scratches and dents no matter what. It also does an excellent job of muffling road noise so you can enjoy your music or just peace and quiet undisturbed. While it might be one of the more expensive options, the U-POL Raptor comes with a lot of high quality product. Plus, it comes with a spray gun that makes applying the bed liner a breeze. You can achieve solid, even coverage in no time flat. And the liner adheres to the truck bed, so you can be sure that your bed truck will be protected fully the first time you apply it. 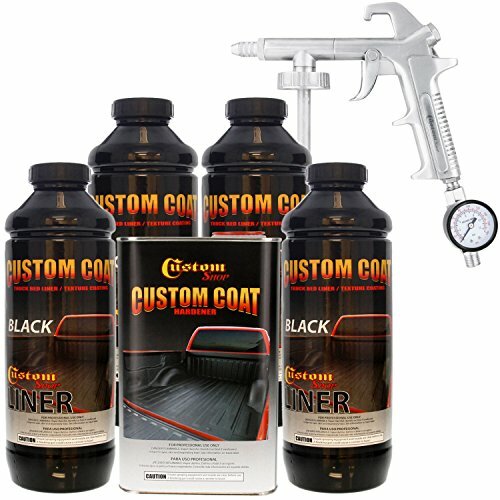 The Custom Coat Spray On Truck Bed Liner kit is another more expensive option, but it also offers great benefits that make it worth the hefty price tag. This liner comes with a spray gun that is simple to understand and use. With it you can achieve easy and even application in the blink of an eye. And once it is on, this liner does its job to the fullest, fighting the elements and physical damage to your truck bed. On top of that, it reduces road noise and vibrations for an overall smoother ride. The Custom Coat is definitely more expensive, but it does the job well enough to justify the price. The only other big issue with this liner is that it does not last as long as some other brands, and may need to be reapplied more frequently. 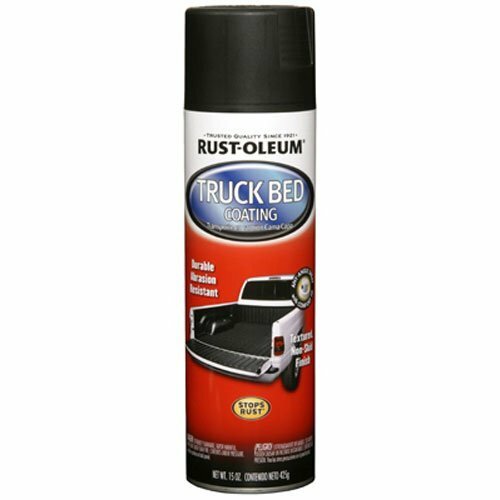 The Rust-Oleum Automotive Truck Bed Coating Spray is an inexpensive yet effective choice for protecting the bed of your truck. This liner adjusts itself to fit snugly to the exact specifications of your truck bed so you know every square inch is as protected as physically possible. It also protects against damaging issues like rust and scratches, turning your truck bed into an all-around safer place. On top of all that good stuff, it also silences a lot of road noise for more tranquil driving. The Rust-Oleum liner does need a few bottles to fully cover most truck beds. Also, the spray bottles this liner comes in have had some issues. A few have clogged easily, while others have been leaky or cracked. However, as long as there are enough good bottles to do the job, this liner is an excellent choice to cover your truck bed. The PEAK/HERCLNR Herculiner Aerosol Bed Liner is a versatile, easy to use choice for protecting your truck’s bed. This liner comes in aerosol spray bottles that spray well and effectively without much hard work at all. It also works with several materials, having no problem binding to whatever you need it to cover. Plus, this liner still does the most important thing of all – protect your truck bed. This choice is resistant to any scratches, scuffs, or dings the world might throw at it. The Herculiner is a breeze to apply, but you need to allow for a decent amount of time so that this liner can fully dry and set into the bed. This particular liner takes a bit longer than most others due to achieve that. Along with that, you will need several bottles to be able to cover most truck beds. 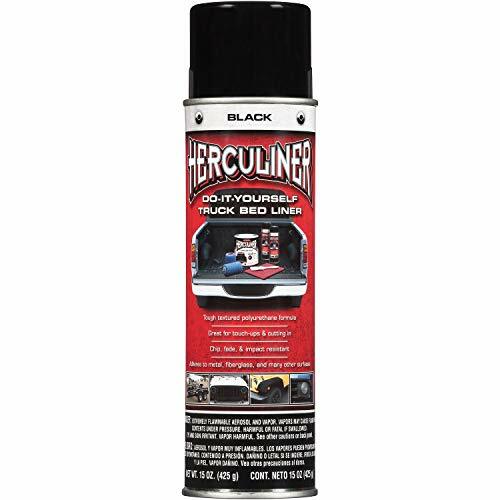 But once that liner is applied and adhered, the Herculiner is a great option for a spray on bed liner. The Dupli-Color Truck Bed Coating liner is a cheap and effective way to protect your truck bed in a pinch. This liner does not cost much at all, yet still is able to protect against damage as well as many pricier liners. Plus, this liner dries fast, so you can be loading all sorts of things in your truck bed in no time with no concerns about damaging the truck. To cover most normal sized truck beds, you will need at least a couple bottles of the Dupli-Color spray on liner. This liner is also not for the impatient, as you might have some difficulty spraying from the nozzle thanks to clogging issues. Also, it is not the most durable option, as you will likely start noticing peeling and flaking sooner than you would expect. However, all in all, it is an effective liner for the low price available. The PlastiKote 264 Black Truck Bed Liner is a strong choice that will adhere fast and last a long time. This liner is resistant to the elements, able to handle all sorts of moisture, heat, and cold. Plus, if you spill a little gasoline in your truck bed, this liner will stand strong instead of corroding like some other brands. It has a quick drying formula that makes it effective quickly, but it is durable enough to keep its grip and strength over a long period of time. The PlastiKote is aptly named, because it leaves behind a sort of cheap, plastic feeling that does not feel as pleasant as other brands might. You will likely need multiple bottles in order to fully cover your truck bed, but even then it will still provide a fairly thin coating compared to other liner. If you do not mind the plastic accents, then this liner is a great choice to protect your truck. The Rust-Oleum Automotive 253438 Truck Bed Coating Spray is an enticing option primarily because of its low price tag, but that is not the only benefit it has to offer. Besides doing the necessary like protecting your truck bed from damage and rust, it also comes in a fun tan color that might accent your ride better. If you are looking for something different in your spray on bed liner, this option could be what you need. The Rust-Oleum Automotive 253438 is a fun choice because of its color, but it is not a perfect option. For one, it takes multiple bottles to fully line an entire truck bed. On top of that, the nozzle does not spray evenly and is prone to build up and clogging. In the end, this spray on liner could still be the choice for you if you want a different option for an easy price. Whether you are hauling lumber and cinderblocks to a worksite or just helping your buddy move a couch into his new apartment, your truck carries a lot of weight for you. If you are not careful and do not take care of it, pretty soon your ride will start failing on you. Do not get caught in a situation where your truck bed cannot handle the load. Using a spray on bed liner will give your ride the protection and durability it needs to always come through for you. No matter what the world throws at you, your truck will help you carry it.